In general, the term urine spraying means when a cat "marks" his environment. When a cat sprays he will back up to a vertical surface (such as a wall) hold his tail high while rapidly twitching it and emits a forcible spray of urine on the surface. Oftentimes, the cat's back feet will be treading during the spraying. Marking is the term generally used to denote both the standard urine spraying while standing and urine marking while in the squat position. Spraying is form of communication in cats. Cats use spraying and marking as a normal communication tool and is most often seen in intact male cats. However, intact females are also known to spray or mark. A cat sprays the urine and, later, another cat may happen upon the mark, sniff it and receive the message contained in the urine (i.e., the female is in heat). It is suspected the urine spray contains various information including reproductive status, individual identity, and time that cat was there. As far as I am concerned it smells much more pungent than normal urine. Most cat owners tend to assume when a cat sprays it is upset, angry or spiteful, but that is not always the case. Cats do spray when they are upset, so getting to the root of the problem is the best way to eliminate it. Sometimes spraying may be a sign of lower urinary tract disease. Any time your cat urinates in an inappropriate location you should consult your veterinarian. Yes, intact females can and do spray, especially when in heat. Spaying the cat (by removal of the cat's reproductive organs) reduces the likelihood of urine spraying and is a very effective way to stop spraying. Estimates as high as 90% of male cats will stop spraying when neutered (castrated). Unfortunately, this leaves 10% of neutered male cats that may still exhibit spraying behavior and it is estimated 5% of spayed female cats will still engage in this behavior. (2) determine what course of action to take to stop the cat from spraying. If your veterinarian rules out any health issue with your cat, and the cat is already spayed or neutered, there are a few things that you can do to stop this behavior. This includes environmental management, behavioral modification, pheromone therapy, and drug therapy options. Add more litter boxes to the household. In general rule, there should be one litter box per cat in the house, plus one (i.e., if there are two cats, there should be three litter boxes available). On a daily basis, scoop the litter boxes. 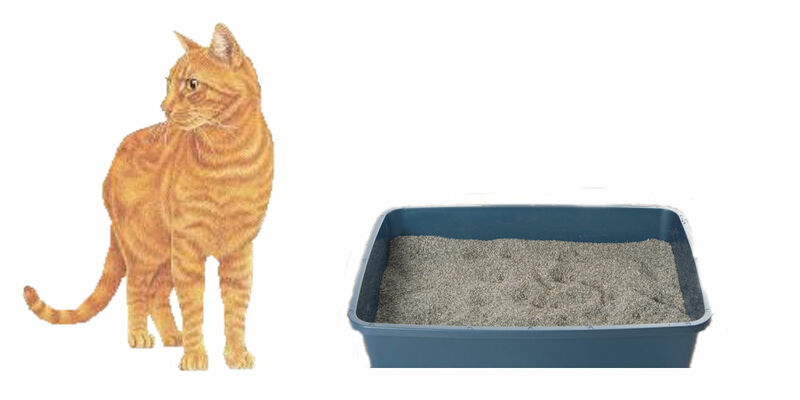 Wash the litter boxes weekly and put new litter in the clean, dry litter box. Use an enzymatic cleaner on the areas where the cat has sprayed so that the cat will not return to the area to "re-mark" it. This is a VERY important step. Create an environment of "plenty" in the house by adding multiple feeding spots, different litter box locations, and resting perches spread throughout the home. Identify and resolve any conflicts the cat may have with other cats in the household. Make sure that the cat is not reacting to what it perceives as an "unpleasant" change and is therefore, angry at you. Identify and limit exposure to any triggers for spraying. Provide indoor social activities: more attention, play, treasure hunts for food, etc. NEVER punish the cat for spraying. Contact your veterinarian regarding the use of Feliway® in your home. Feliway® is a synthetic copy of a cat's facial pheromone. Cats use their facial pheromone to mark their territory as safe and secure. According to the information on the Feliway® site, Feliway® creates a state of familiarity and security in the cat's environment by mimicking the cat's natural facial pheromones. This comforts and reassures the cat while they cope with a challenging situation (i.e., changes in the household, adding a new cat to the household, etc.) and/or help prevent or reduce the stress caused to a cat during that change. Feliway® comes in a spray or an electric diffuser. Contact your veterinarian regarding the use of serotonin re-uptake inhibitors (i.e., fluoxetine (Prozac) to treat spraying. The links below will take you to Amazon.com.